Who were Native Indian Chiefs and why were they famous? Summary: The Native Indian Chiefs were all famous for their different stands against the encroachment of their tribal lands, the destruction of their culture and way of life and their opposition to the forced relocation of their tribes to Indian territory and reservations. 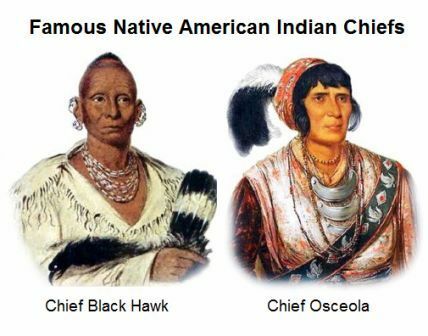 The following list contains interesting facts, names and pictures the most famous Native Indian Chiefs and details of their tribes. Click the appropriate link for comprehensive facts about each Native Indian Chief. Tribe: Narragansett, meaning "(People) of the Small Point"
Tribe: Tuscarora meaning "Hemp Gatherers"
Famous for his leadership and the "Long Walk"